Georgie Tanner is at it again! 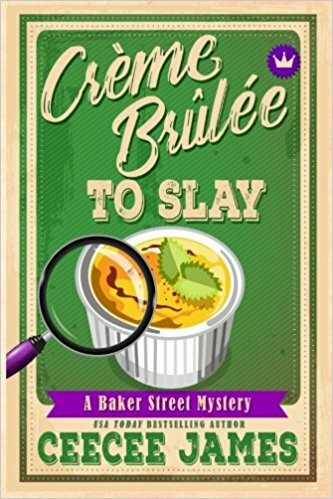 In this third book of the Baker Street Cozy Mysteries, Georgie has volunteered to help at a benefit dinner where a sword that George Washington presented to the man who captured John Andre is displayed. When one of the diners turns up dead and the sword is stolen, Georgie (and her curiosity) are thrust right into the middle of the mystery. This is a fun quick read. The mystery of the dead woman was good, but I wish there had been a little more added to the part with the missing sword. I always like the American history incorporated in this series, but that was minimal in this book partly due to it being a slow time for the B&B. I like that Georgie and Frank's romance is heating up. And I'm waiting to learn more about the mystery that has overshadowed all of the books in the series: what happened to Georgie's ex-fiance? An important clue is given here (no spoilers). 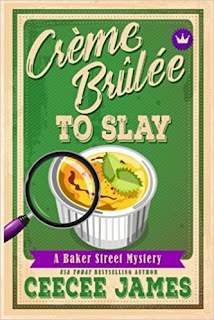 Creme Brulee to Slay is another fun read, and I heartily recommend this series.